to get a list of voters on screen one has to go through unnecessary exercises. It has to be made simple and user friendly. for eg if any one enquires for a particuler assembly list it has to be on the screen immediately. The present process is not user friendly. mr. rajgopal is exactly right . Polling_Station	Govt Kannada Boys Higher Primary School West Wing North Side 5th Room, Hirepadasalagi. i am very unhappy with janagraha, we have not been delivered the corrected voter idea card even after two years in shantinagar contistu ncty please send them the mail and see that all election id cards are delivered at the earliest. king street people are yet to receive the cards. submission of application for modification is to be made on line. then it would be user friendly. I had applied for inclusion in the electoral rolls, DK district.At present my name is included in the list but I haven’t received my EPIC . How do I receive my EPIC? apply for enter the names of mine and my family members in prescribed form in time. But its enter or not want to see. please help. my assembly constituency No. and name is 11 Belgaum uttar. applyed for voterid card but till not arrived.whenever my friends votercard arrived.our adress is same#103/1,goldennagar,hongasandra,begur road,banglore 560068. my name is uday shankar and my fathers name is sri parmanand kumar. I have already register and submit online my voter id but still i have not received the voter id what is the problem we dont now kindly check my self and my wifes voter id and kindly send us our application nos are KABDUL FEROZ-328084 and K.MANNAZ SULTHANA-328267. I am a new voter and applied for voter card. i went to BBMP office to check whether i got my voter card or not. they said to visit ww.ceo.karnataka.kar.in and check the status, where i can’t do that. can you please tell me the steps to check my voter id status. There are lots of differences in high publicity & practical interest to work .as the way in Govt Organizations in India. No responsibility & shifting and escaping to facts. for include in AC No.153, BBMP Ward No.198,PS:Thalghattpura/.Form 7 to cancelled AC-172,BBMP ward No.176 , PS:Mico Lyt EPIC XUL4055802,4055794,4055786,4055801 & 4055828 . Now came to understand From Ward 198 Thalghatpura Office- that the March last week or 1st week of April , the final list can be seen. Lets wait & watch. Is it democracy & Election Important ? 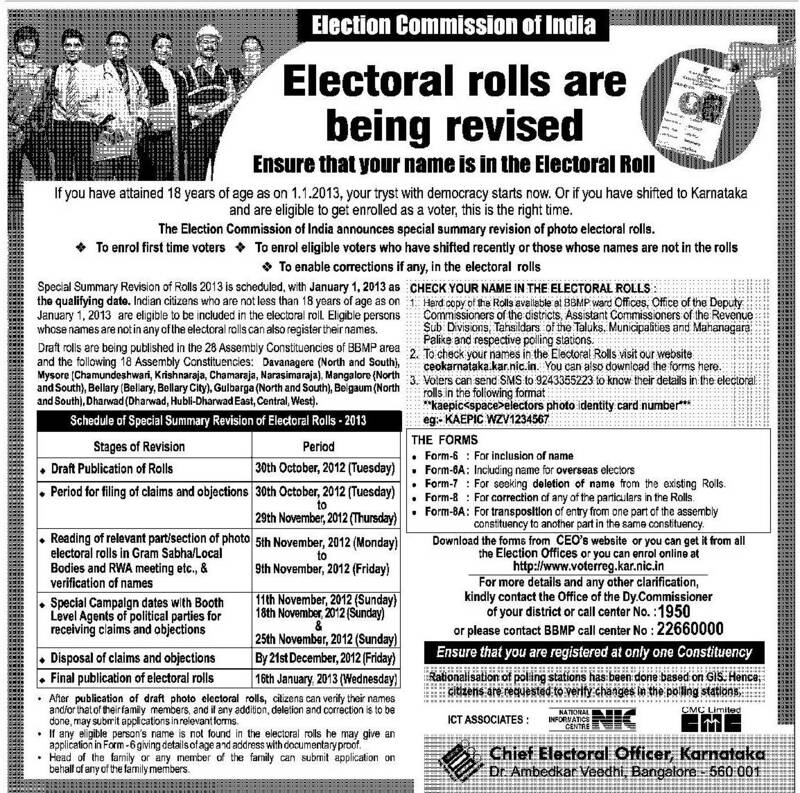 we could not able to vote on 17.04.2014 due to in absence of our name in Electoral roll even after 4+ months lapsed. I want to know that is my name enrolled in voters list or not so that it would help me out to go and get my voter id card from BBMP office.. I have applied for voter card 3times but not yet i have received….. I have filled form8i with application No. 617210 and submitted at Bangalore One on20/12/13 only for change of address. How to know whether my address is changed? 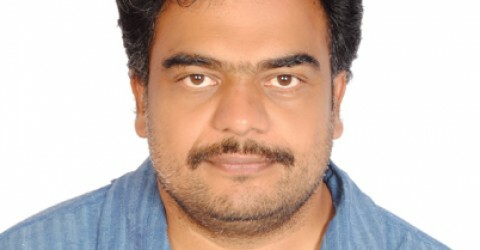 Dear Sir, My name is Girish. I was trying to enroll my name in voter ID but the related page is saying ” not able to load” what is the way out to enroll my name. I tried http://www.voterreg.kar.nic.in website to enrol my name but to my dismay I got an error message as Service unavailable and Server error. Kindly ensure that the web site is available. I am a senior citizen aged 70 and I had shifted my residence from Ramamurthynagar to sarjpura because of which my name was not found in any of the list. Set right the server and make available the online registration and enrolment facility early. I have lost my. Voter I’d .plz issuve duplicate. plse if u find my voter id kindly inform through e- mail .